A range of guest houses, hotels, bed and breakfasts and country inns. They are good quality accommodation mainly in historic country inns. All accommodation is on a B&B basis. Please book early to ensure that we can secure our first choice accommodation. Detailed walking notes with information about the local sites and Thomas Hardy related information along with poetry and prose. Your independent walking holiday literally and literarily follows in Thomas Hardy’s footsteps. You take some of his favourite walks as well as the routes taken by many of the characters from his novels. You will discover the real life settings that inspired Hardy’s fictional Wessex, walking in the area of rolling hills between the Blackmore Vale and the Frome Valley at Dorchester. Your route begins in Dorchester (Casterbridge) where you will spend a couple of days exploring the settings for The Mayor of Casterbridge, Far From the Madding Crowd, Tess of the d’Urbervilles, Under the Greenwood Tree and Return of the Native along with where he was born, grew up and wrote his novels and poems. Leaving Dorchester behind you will discover some of Dorset’s village gems, such as Milton Abbas with its identical thatched cottages, Cerne Abbas with its chalk giant and tiny Bingham’s Melcombe with its manor house, church and rectory. You will get the opportunity to visit relevant landmarks, properties and gardens, including Hardy’s Cottage, Athelhampton House and Minterne Gardens as well as enjoy the wonderful Dorset scenery in an area designated as Dorset's Area of Outstanding Natural Beauty. Find out more about the stunning Dorset Jurassic coastline and the Dorset weather. The walking days on this independent holiday average about 17km. The walking varies with some easy sections, whilst others sections have some steeper ascents and descents. For the most part your walking trail follows local footpaths, though there will be sections that follow national trails, such as the Wessex Ridgeway. This independent walking holiday in Dorset has a range of good quality guest houses, bed and breakfasts and inns. In some locations the choice of accommodation is limited so please book early to ensure that we can secure our first choice accommodation. Where possible, we choose guest houses with a distinctive local character, where charming surroundings are married with a warm welcome. All accommodation is on a B&B basis. Evening meals are taken in local cafes, tea rooms, restaurants and pubs, whilst lunches can be bought at local shops or from your guest house. A couple of examples are listed below. The Fox Inn Inn The Fox Inn is in the pretty rural village of Ansty and is the original home of the Woodhouse family (Hall & Woodhouse) situated across from the original brewery, which was founded by Charles Hall in 1777. Dorchester is served by a main line train station and there are regular direct trains from London Waterloo, which takes approx. 3hrs. National Express run 1 direct service from London Victoria per day which takes approx. 3 to 4 hrs. Bristol airport is about 1.5 hours drive. 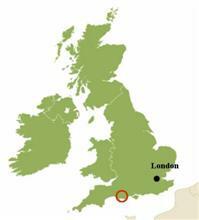 Exeter and Bournemouth (Hurn) International Airport are approximately a one hour drive. London Airports, Heathrow, Gatwick and Stansted, have rail links into London for train and coach services to Dorchester. Long term parking in Dorchester is limited. So if planning to come by car, please advise us well in advance so we can check your options. At end of holiday, you will have a transfer back to Dorchester, if required.